In order to protect and preserve the health of your family here at Hello Carpets & Floors we developed the best carpet cleaning process. Using only the most advanced equipment, in combination with safe cleaning agents, we will bring your indoor fibers and fabrics to the cleanest and healthiest state. We leave behind the safest possible indoor environment for you and your family to enjoy. Next, we spot any special stains with carefully chosen professional products to loosen and remove them during steam extraction. Some examples of stains we can remove – gum, wax, red stains, soda, and pet urine and odor. We move small items out of the way and make sure your pets are safe and out of the way of our equipment and tools. We then apply an emulsifier pretreatment all over the carpet, chosen for your specific carpet type and soiling level. Treatments are an essential part of the carpet cleaning process and is why pre-inspection is important. *After the first initial 6 steps is where most companies differ. This is where we shine; not every home can be treated the same with “special water”. Each home has different types of carpet and we have the knowledge and experience to choose the best products to get the best result. We use non-toxic gentle products that give you the best carpet cleaning you’ve ever had. The carpet is gently buffed with an oscillating brush machine to completely break soil and grease away from the carpet fiber. Our soft carpet brush does not damage the fibers but provides enough power to fully emulsify the dirt. Then we Steam Extract the carpets using our Truckmount System. The carpet is rinsed with 210 degree hot water and simultaneously wet-vacuumed, thus the term extraction. 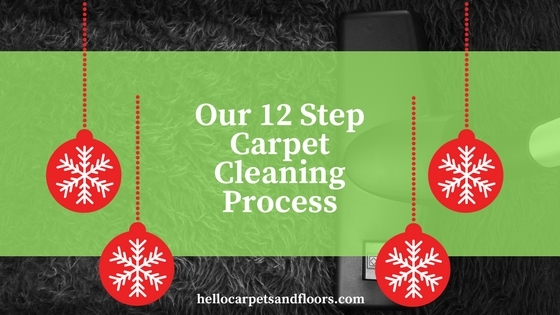 This method is the only method recommended by Mohawk Carpet Mills and is universally recognized to be the most thorough cleaning you can do for your carpets. After Steam Cleaning, we do a thorough post spotting procedure to remove any other stains that might be remaining after the initial steps. One of the final steps in providing you with the best carpet cleaning serivce is our SpeedDry. We place specialized carpet drying fans to dry the carpet. This greatly reduces dry times and also minimizes browning, wicking and re-spotting. Our final step involves YOU, our valued customer. We walk you through how the cleaning went and show you all that was accomplished during the cleaning, if there is any additional recommendations we might have for you, or if there were any complications during the cleaning we let you know. We believe in open communication and excellent customer service. We explain to you in clear English how everything works and what we can offer to solve most any concerns you have. We invite you to review our service and be a part of supporting our local carpet cleaning business. We hope to WOW you at every clean! Here at Hello Carpets, We Don’t have any Gimmicks, just FABULOUS results. Give us a call at 503 765-6264 or Book Online to experience it for yourself!